For LME Gateway 7.18.25 and higher, these sections list the parameters that must be set to establish and maintain the Order and Fill Server connection to the exchange. LME Gateway 7.18.25 supports LMESelect 9.2 upgrade, as well as MiFID Ii compliance. By default, this parameter is not present in hostinfo.cfg. Add the [OrderServer] section when configuring the UseDefaultMiFID parameter in this section. 1: Sends default MiFID values. 0: Does not send default MiFID values. By default, this parameter is not present and the Order Server does not send default MiFID II tag values. Note: If users have not upgraded to TT client application versions (7.17.80) to support configuration of the MiFID II fields, you can enable UseDefaultMiFID to send MiFID default values. However, clients need to upgrade all relevant client software prior to January 3, 2018, at which time proper population of these tags will be required for regulatory purposes. This is the user-defined section heading. By default, installation sets this to [OrderServerSession_1]. Sets the exchange-provided IP address or Fully Qualified Domain Name (FQDN) that the TT LME Gateway uses to establish connectivity to the Exchange. Enter a FQDN if a DNS resolver is configured in hostinfo.cfg. Sets the exchange-provided port that the TT LME Gateway uses to establish connectivity to the Exchange. Identifies the name of the firm that connects to the exchange for order data and is supplied by LME. A unique GatewayCompany value is required for each order session. This field supplies the value of the FIX tag 49 (SenderCompID) in all outbound messages for the connection. Identifies the client’s Member login. This seven-character maximum variable must match the Member portion of the MemberGroupTrader ID defined in TT User Setup. The Member ID is not provided by the exchange. The value must be different from GatewayCompany and unique across all order sessions or else the Order Server will not start. 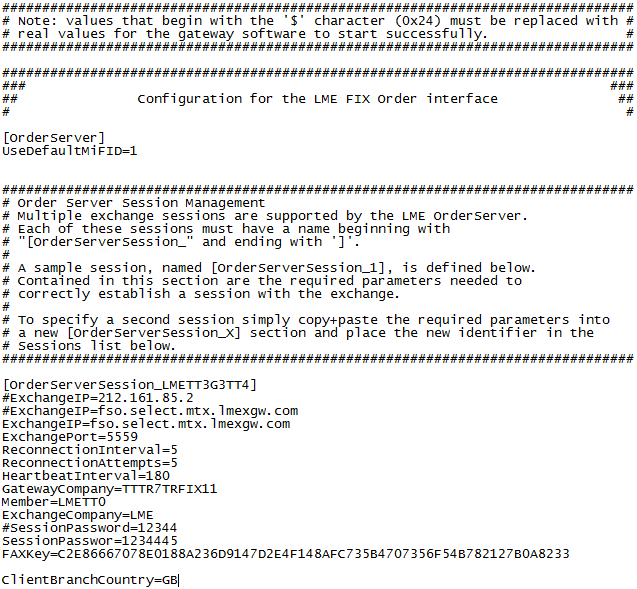 If there is a duplicate Member parameter configured on a multi-session TT LME Gateway, the Order Server will not start. This value must be unique per [OrderServerSession_#]. Identifies the name of the exchange host that sends messages to the TT LME Gateway. This field supplies the value of the FIX tag 56 (TargetCompID) in all inbound messages to the TT LME Gateway. Sets the password the Order Server uses to connect to the exchange for order data. This is assigned by the exchange. This field supplies the value of FIX tag 96 (Raw Data) in the Session Startup request message sent to the exchange. Identifies the exchange-assigned key used to encrypt the SessionPassword. Sets the amount of time, in seconds, that the Server waits before attempting to reconnect to the exchange. By default, this parameter is not present and the Gateway behaves as if ReconnectionInterval=1. Sets the number of concurrent FIX login attempts made by the Gateway. If the Gateway is rejected after the specified number of attempts, it will shutdown. By default, LME Gateways install with ReconnectionAttempts=10. Sets the frequency, in seconds, that the Price Server sends a heartbeat to the exchange and expects Heartbeats from the exchange. In order to maintain a connection, the Price Server must send and receive a heartbeat to and from the exchange at the HeartbeatInterval specified. Setting HeartbeatInterval to a value less than 1 will result in the parameter being set to the default value. By default, LME Gateways install with this parameter set to 30. Configured on a per session basis when all users on a session are located in the same country. Enter a two-character Country Code (e.g., GB). Note: If users on a session are in multiple countries, the Client Country is defined per user in the X_TRADER Customer Defaults FFT4 field along with the LME Client ID and separated by a pipe (|). For example: ABC123|GB.